Made from ultra-soft microfleece, these washable liners will save you both time and money. Placed between baby and the nappy, it catches the poo for easy disposal down the loo whilst letting the wee pass through to be absorbed by the nappy. 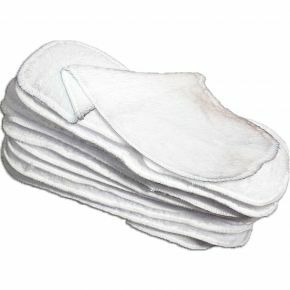 No need for disposable liners when you buy this pack of 10 washable liners. These liners are very fluffy and soft. It's my favourite liner to use with night nappies. The only down side to these liners is it's a little bit harder to remove a squished poo from. Therefore I like to use a mix of TotsBots Reusable Liners and these Little Lamb Reusable Liners.